With two New York Rangers losses in two days, the Washington Capitals came into tonight’s game looking to take the lead in the Metropolitan Division. It was a struggle to say the least and appeared the the grueling schedule of seven games in eleven days caught up to the players. But the Caps found a way to improve to 17-5-1 and prove that a win is a win, no matter how ugly. A 1-1 tie after the first period did not reflect how lopsided the period actually was. The Leafs dominated possession and shots (16-4). It was only early on, after two great saves from Braden Holtby, that Jason Chimera sped up ice winning a footrace on the counterattack, and took a wrist shot that whizzed into the net. The Washington Capitals rode into frosty Toronto’s Air Canada Centre on Wednesday night red-hot. Coming into the game against the Toronto Maple Leafs, the Capitals lost just one regulation game over their past fourteen, a 10-1-3 record since Dec. 4. This game was a terrible collective effort from the Washington Capitals. Attribute it to what you will, but it was atrocious. Losing 6-2 is not a good look. Especially against the Leafs, who are kind of good but also prone to being absurdly bad at times. The Caps’ top line was not bad, even though the rest of the team was, and thus the only thing worth talking about after an otherwise embarrassing performance. First star: Nicklas Backstrom. He earned his 19th assist of the season on Tom Wilson’s third period goal, and collected two assists in the loss. He leads the team in points (24), and is riding a 5 game point streak where he’s amassed 8 points (1g, 7a). Second star: Tom Wilson. One goal, 15 PIMS, 5 shots on goal, and 4 hits. And all in 12:08. He knows how to make the most of his time. Very efficient. Third star: Alex Ovechkin. He didn’t score a goal in the loss, but led all skaters in TOI (20:45), PP TOI (5:33), and shots on goal (7), plus 4 hits. In likely their worst performance of the season, the Washington Capitals sustained a 6-2 drubbing at the hands of the Toronto Maple Leafs. Plagued by defensive breakdowns and shaky goaltending, the Capitals that bounced back to win on Long Island were not the same ones that entered the Air Canada Centre in Toronto. The Leafs’ first goal, scored but Morgan Rielly, came on a deflection that bounced off the shinpads of at least two Caps defensemen. There wasn’t much Justin Peters could do to prevent it. Defenseman Cody Franson added a power play goal during the final seconds, and the Leafs led 2-0 at the beginning of the first period. Justin Peters was replaced by Braden Holtby after allowing 2 goals on 6 shots in the opening stanza. Holby didn’t fare much better than Peters, allowing 3 goals on 12 shots (a pair from Tyler Bozak and one from David Clarkson). Troy Brouwer’s PPG got the Caps on the board before the period expired, but Bozak and Clarkson’s tallies put the game out of reach before 2nd intermission. Trailing 5-1 at the start of the third, Barry Trotz made a strange decision to give Holtby the hook and put Peters back in net. Much like the previous goalie swap, it didn’t help. It didn’t help because this loss wasn’t all about the goaltending. It was a product of defensive breakdowns and fatigue from playing 3 games in 4 nights. Tom Wilson scored his second goal of the season in the final frame, but it was lipstick on a pig. Joffrey Lupul added insult to injury and the Leafs’ sixth goal of the night. The pair of John Carlson (who assisted on both Capitals goals) and Brooks Orpik were on ice for 4 of Toronto’s 6 goals, which is less of an indictment of Carlson than it is of Orpik. It’s been discussed that Orpik is actually bringing Carlson down, and you certainly expect more than what we saw tonight from the team’s top defensive pairing. Orpik was caught coasting on more than one occasion that led to a Leafs goal. Bad night for everyone, but Orpik was exceptionally terrible. For as much as he’s making, he should be better. Alex Ovechkin had 4 shots on goal in the first 4 minutes of the game, had a final total of 7 shots on goal for the game, and led all skaters in PP TOI with 5:33, and all forwards in TOI with 20:45. There’s a lot this guy can do, but he can only carry the team on his back so far. Nicklas Backstrom collected assists on Brouwer and Wilson’s goals, and has 8 points in 5 games (1g, 7a.). Backstrom had the second most TOI of all forwards with 19:56, and logged 4:20 of PP TOI. 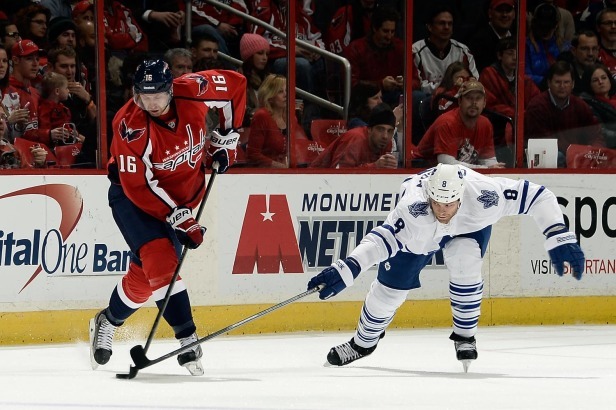 The Capitals outshot the Leafs 37-23. Peters made 11 stops, and Holtby stopped 12. Their respective SV%s were horrendous. Tom Wilson had another strong showing, and if you ignore his shenanigans at the end of the third period, he’s been okay at keeping his nose clean. His resume for the night boasted one goal, 5 shots on goal, and 15 PIMS. After a dominating first period, the WashCapitals led on the scoreboard and in shots on goal, but allowed the Toronto Maple Leafs to creep back into the game in the second period, but held them off in the third period for a 4-2 win. Troy Brouwer scored his 19th goal of the season on the Capitals’ first power play of the game for the early lead. It was assisted by Swedes Marcus Johansson and Nicklas Backstrom. Johansson played the puck from behind the net to a wide-open Brouwer in the slot. The lone even strength goal scored by the Capitals in the first period was Jason Chimera’s 13th of the season, which deflected off his skate and in. Joel Ward took the initial shot, and thought the goal was his, which would have been his 20th of the season. Ward got his 20th goal, a career-high, for real this time, on the Capitals’ second power play. Dustin Penner parked himself in front of James Reimer in the crease, and dexterously slid a no-look pass in Ward’s direction. Ward put a wrister behind Reimer, and the Caps were comfortably in the lead at 3-0 with most of the first period behind them. Late in the first, despite the Leafs only managing two shots on goal the entire period, Troy Bodie nicked Jaroslav Halak for a goal, ending the period down 3-1. Shades of the second-period collapse against the Canucks on Friday evening began to appear again in the second period against the Leafs. The Capitals were outshot 20-6 in the period, and the Leafs scored their second unanswered goal, edging the Caps’ two-goal cushion to 3-2. With the seconds waning in the third period and Reimer pulled, Troy Brouwer banked a shot from the defensive zone off the boards towards the Leafs’ empty net. Nick Backstrom had the presence of mind to follow the puck all the way down without touching it, to ensure that Brouwer would get his second goal of the game and 20th goal of the season. It was his third multi-goal game this season. The Capitals will now head to California on what is their toughest road trip of the season. No teams have come away from a west coast swing with three wins, and the Capitals know they need to bring home at least four points to have a chance to make the postseason. Adam Oates places a lot of importance on the Washington Capitals playing “correct” hockey. Early in his tenure as Capitals coach, he remarked that he’d rather see his team play the right way and lose rather than play the wrong way and win. The last several games, the Capitals had been playing decent hockey, but were still having a hard time winning games. Frustrating, to be sure. Friday night against the Toronto Maple Leafs, the correct hockey that the Capitals have been playing paid off with another regulation win, the second in as many nights, a 3-2 decision over the struggling Leafs. Backstrom, Alex Ovechkin, and Joel Ward all contributed goals in the 3-2 win. Mikhail Grabovski notched an assist against his former team. Since switching up the top two lines two games ago, Adam Oates is pleased with the results so far. “They are clicking a little bit which is good – chemistry,” he said. Michal Neuvirth got his first start since November 22, 2013 and stopped 32 of 34 shots in the win. The two Leafs shots that did get through were tipped, so there wasn’t much the goaltender could do in that instance. “I just told myself ‘it’s just another game.’ I’ve been playing in this league for some time, and I was confident,” said Neuvirth. “I thought he played a great game, I really did,” said Oates. With less than two weeks remaining in the regular season, the Washington Capitals extended their winning streak to eight games Tuesday night in the Verizon Center in a 5-1 romp over the visiting Toronto Maple Leafs. Jack Hillen, Martin Erat, Troy Brouwer, Alexander Ovechkin, and Marcus Johansson scored for the Caps, while Braden Holtby delivered the type of stellar performance in net observers have come to expect, stopping 29 of 30 Maple Leafs shot. Holtby stonewalled Toronto for the first two periods of the game and then some, allowing just the one goal.